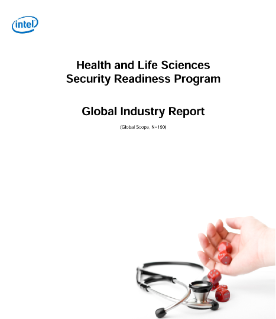 The Intel Healthcare Security Readiness Program enables HLS (Health and Life Sciences) organizations to benchmark their security against the industry and peer organizations of a similar locale, type, and size. Any HLS organization worldwide including providers, payers, pharmaceuticals, life sciences, and business associates or data processors are eligible to participate in this security readiness ...program. Over 140 HLS organizations across 9 countries are currently participating in this program. This report summarizes industry level, aggregate, anonymous results of the security readiness program including how HLS organizations are prioritizing breach types, distributions of security readiness scores for each breach type, and the level of implementation of 42 key security capabilities across the industry. These results are based on high quality data, acquired by trained security assessors, with verified HLS organizations and security teams, and participating HLS organizations can update their assessment data at any time. Delivering real-time data, Intel® Core™ i7 processor-based medical carts improve patient outcomes and provider efficiency. Translational Genomics Research Institute develops early diagnosis and treatment of diseases through molecular medicine. This technology transforms smartphones into microphones for instant transcription into the digital medical record. This technology enables doctors to be mobile, connecting instantly with patient data for diagnosis and treatment anywhere. Technology enables physicians to share and monitor data instantly across multiple devices, saving time and improving care. Mobile devices powered by Intel® processors and Windows* 10 help clinicians engage with patients.